Few people know that John Muir – nature writer, champion of Yosemite, and a founding father of the American environmental movement and of our system of national parks – traveled to South America in 1911, alone at the age of 73, seeking Araucaria araucana, the so-called Monkey Puzzle Tree, in its native forests on the slopes of the volcanoes of central Chile. Unfortunately, Muir didn’t have the chance to tell us about this last adventure of his amazing life. He died less than three years after returning from the trip, and his energies in those last years were largely consumed by the final stages of the battle over the construction of Hetch Hetchy Dam in Yosemite National Park. He wrote to a friend about his trip, “I am now writing up some notes, but when they will be ready for publication I do not know… [It] will be a long time before anything is arranged in book form.” Only in 2001 were Muir’s journals and correspondence finally published as John Muir’s Last Journey, edited by Michael Branch, making this last adventure more widely known and accessible. After a visit to Yosemite in October (see my story about Yosemite National Park) I read environmental historian Donald Worster’s insightful biography of Muir, A Passion for Nature (Oxford U. Press, 2008), which in turn led me to Branch’s book about Muir’s South American (and African) trip. My son, Jonathan, would be in Patagonia during the austral summer, repeating historical photos of mountains and glaciers in the southern Andes, a sequel to his work in the Sierra Nevada last summer, with the Alpine of the Americas Project. 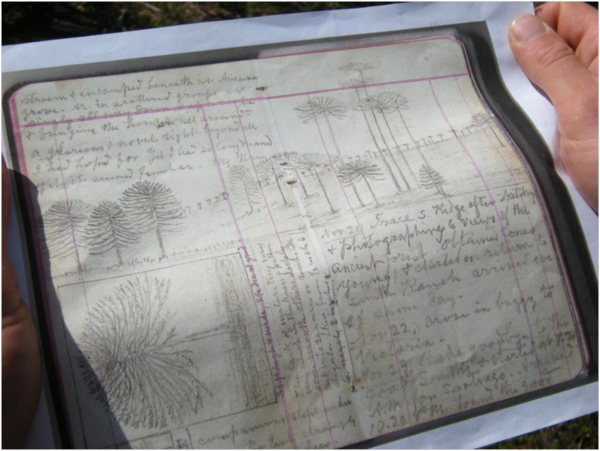 Why not try to find and rephotograph the places where Muir saw and sketched Araucaria araucana? We began making plans to try to follow Muir’s footsteps in Chile. We purchased high resolution digital images of the pages of Muir’s journal covering his time in Chile, and containing the sketches he made, from the John Muir archive at the University of the Pacific in Stockton, California. Muir was an accurate and detailed landscape artist, and we imagined that the sketches in his journal, interviews with local residents, and perhaps some help from Google Earth, would allow us to find the exact spot where Muir walked, camped, and sketched. On the night of November 20, 2011, according to his journal, Muir and his companions “descended long cane-covered S. slope to the bottom of another glacier meadow valley by the side of a brawling bouldery stream & encamped beneath an Araucaria grove.” Our goal was to find that place and document what it looked like a century later. When Muir decided to travel to South America early in 1911, his wife had died six years earlier, and his daughters were married and settled. He had long wished to visit the Amazon, inspired by the writings of naturalist-explorer Alexander von Humboldt when he was a young man. He was on his way to follow von Humboldt’s footsteps more than 40 years earlier, in 1867, when he contracted malaria in Florida, and after recovering partially, decided to go to California to regain his health and strength. In the spring of 1911 Muir travelled east to New York and Boston, arranging for publication of two new books, and made a trip to Washington, DC, to visit politician-friends, including President Taft, lobbying against the Hetch Hetchy Dam that was proposed to be built in Yosemite National Park. After a hot, exhausting summer, Muir sailed on August 12, 1911 for the Amazon, reaching Belém in about two weeks. 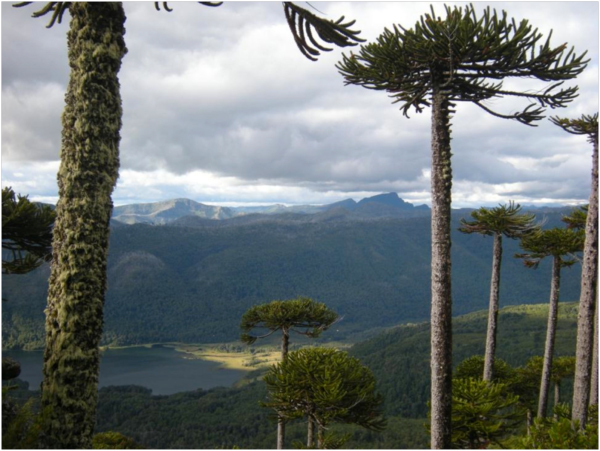 He spent a month travelling up the great river to Manaus, and then went south, with a goal of seeing one of the two species of Araucaria found in South America, Araucaria braziliensis, which grew in forests in southeastern Brazil, not far from Sao Paulo. 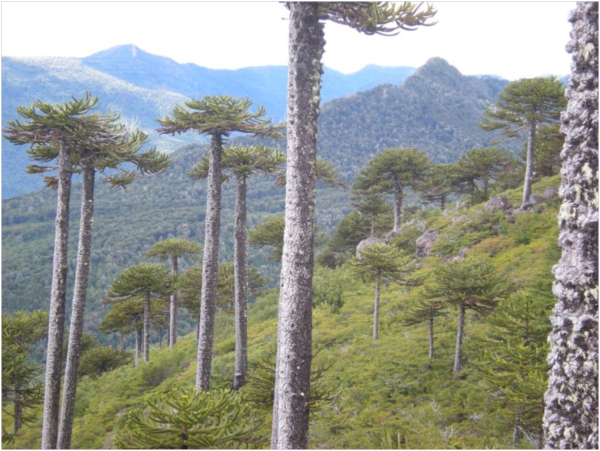 After a successful visit to view this species – with a group of lumbermen setting up a sawmill to harvest the trees – Muir moved on to his next goal: to find forests of the other South American Araucaria species, Araucaria araucana, in Chile. I arrived in Santiago the morning of February 23, after a long overnight flight from New York., checked into the unpretentious Hotel Monteverde in the Barrio Bellavista, and immediately went by subway to the Estación Central, the old main railway station where Muir had arrived. 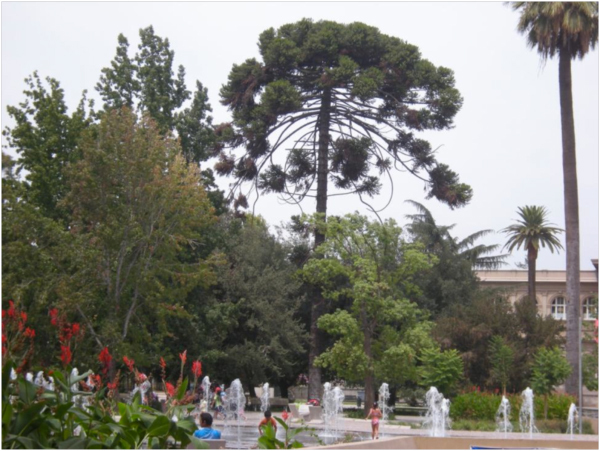 From there it was a was a walk of a few blocks to the Parque Quinta Normal, site of the old Jardín Botánico where Muir had gone seeking information on Araucaria. It was a warm late summer afternoon and children played in the fountain under an old Araucaria, which must have been there when Muir visited. The Chilean flag flapped in a lazy breeze in front of the Museo Nacional de Historia Natural, closed for renovation, where Muir had met the Director of the Jardín Botánico. 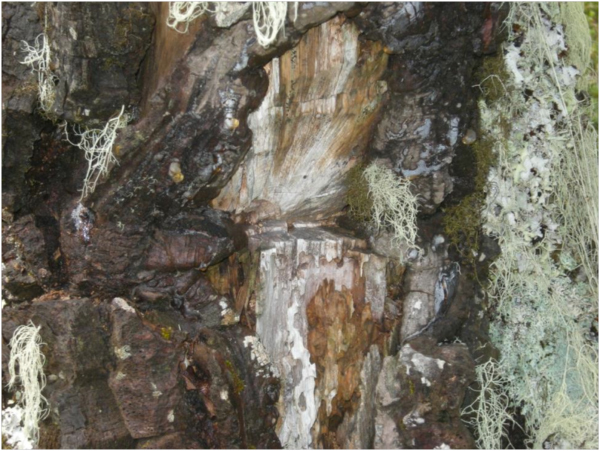 The “fine photograph of old [Araucaria] trees” Muir was given by the Araucaria-clueless Director of the Botanical Gardens is now in the collection of the John Muir National Historic Site, in Martinez, California, and it does give a clue in following Muir’s journey. On the back of this photo is written “Araucarias of Volk. Tolhuaca,” and this reference to Volcán Tolhuaca probably explains why an American to whom Muir was introduced by the Ambassador in Santaigo, Mr. Rice, sent him to Victoria, Chile – about 500 miles south, and directly west of the Tolhuaca volcano – where Rice had a friend, Mr. Smith. On February 24, 2012, I arrived at the airport in Temuco, not far south of Victoria, picked up a rental car – a silver-grey Toyota “Urban Cruiser” – and headed north up the Ruta 5, Chile’s north-south freeway, on an overcast afternoon. Turning east toward the mountains at Lautaro, I stopped on the road toward Curacautín to photograph the volcanoes looming on the horizon to the east from recently-harvested wheat fields: Volcán Tolhuaca, Volcán Lonquimay, and Volcán Llaima to the southwest. I met up with Jonathan and Aníbal Pauchard, a Chilean forest ecologist from the University of Chile in Concepción, and we stayed at a small rural guesthouse beneath Volcán Lonquimay. On the sunny morning of February 26 we set off in search of where Muir had sketched a panorama of volcanoes on the eastern horizon from the ranch of his American host, Mr. Smith, east of Victoria. Muir wrote, on November 19, 1911: “I wandered through broad wheat fields a mile or two from the ranch house, and obtained magnificent views of eight great white volcanic cones, ranged along the axis of the mountains. Spent the day sketching them. Sketched all in outline.” From a recently harvested and replanted plantation of Monterey pine we photographed Volcán Tolhuaca and Volcán Lonquimay, much as in Muir’s sketch, white with new snow from a recent storm. Now the native forests here have been replaced by huge plantations of non-native species – Eucalyptus from Australia, and Pinus radiata, the Monterey pine, native to the central California coast. These plantations have in turn replaced the wheat fields that Muir wandered in, sketching, a century ago. Sketch of the two volcanoes to east of the Smith Ranch made on 19 November 1911. Muir got the names of the mountains wrong – on the left is actually Volcán Tolhuaca, and on the right is Volcán Lonquimay. Image courtesy of the John Muir Papers, Holt-Atherton Special Collections, University of the Pacific, Stockton, CA. Tolhuaca (left) and Lonquimay (right) seen from a recently-replanted timber plantation about 30 km E of Victoria, 26 February 2012. On November 20 Muir wrote in his journal: “Foggy morn 6 o’clock packing for the lofty ridges where grows Araucaria imbricata. 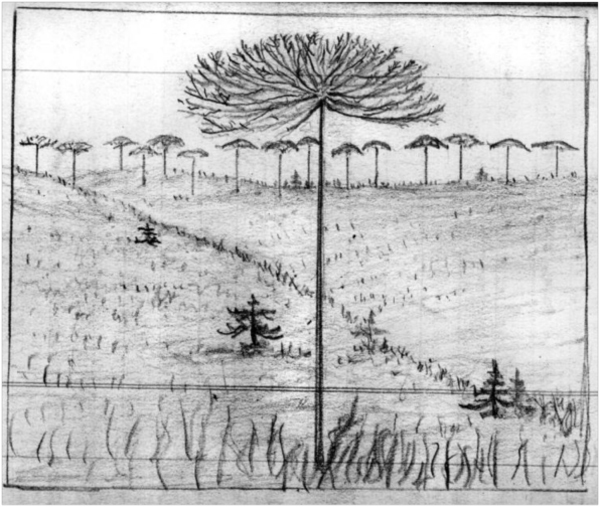 After crossing many hilly ridges & streams ferny & mossy & spacious meads tussocky came in full sight of a ridge 1,000 feet hi bordering the south side of a glacier meadow, the top of which was fringed with the long-sought-for Araucaria.” On this page he made a sketch of a ridge that the party saw, and we thought that if we could find this view of this particular ridge, we would narrow our search still further. Hours spent viewing Google Earth convinced us that the most likely candidate for this ridge sketched by Muir was the ridge just to the north of the headquarters of the Reserva Nacional Malleco, so we headed there, crossing the deep canyon of the Río Malleco on steep, rocky secondary roads more fit for a 4WD vehicle than a Toyota “Urban Cruiser.” When we reached the Reserva Nacional Malleco, it was clear that this was not where Muir had been. Sketch of ridge made on 20 November 1911, from “Big mdow above Lake,” during the day when Muir and company rode horses to where they “encamped beneath an Araucaria grove.” Image courtesy of the John Muir Papers, Holt-Atherton Special Collections, University of the Pacific, Stockton, CA. So the next day we went to the office of the Reserva Nacional Malalcahuello Nalcas, in the little mountain town of Malalcaheullo near where we were staying. 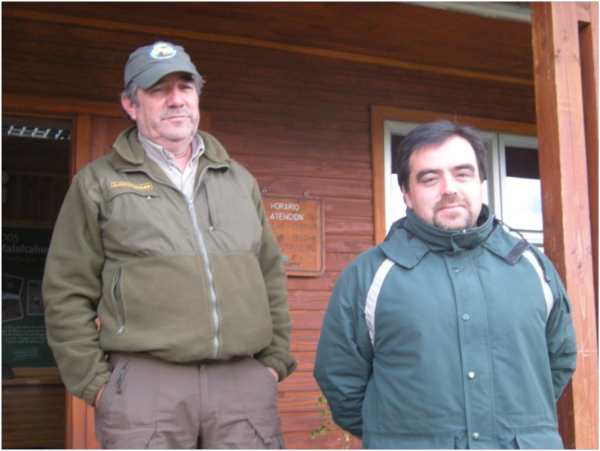 We showed Muir’s sketches to Iván and Florentino, park rangers working for CONAF, the Corporación Nacional Forestal. Iván, who had worked for many years in the Parque Nacional Tolhuaca, immediately recognized the place where Muir must have been. He showed us on a map where it must be, but could only give vague directions about how to get there, mentioning “caminos antiguos” – “old roads.” He suggested that we talk to his friend Isaías, the ranger at Parque Nacional Tolhuaca, for more information. When we showed Muir’s sketches to Isaías, he also immediately – and independently, because we did not tell him what Iván had said – identified the place. It was on private land, south of the national park. He called it “Ruca Choroy,” which in Mapudungun, the language of the indigenous Mapuche people, means “Casa de Loros,” in Spanish, or “Home of the Choroy.” The Choroy, Enicognathus leptorhynchus, is a long-beaked, endemic Chilean parrot, specialized for eating the seeds of Araucaria. Isaías’s grandfather was a colóno, a settler along the upper Río Malleco not far from here. So Isaías is considered a “lugareño,” a “person of the place.” But, like Iván, he was very vague about how to get to where Muir must have been, mumbling something about “caminos antiguos,” as Iván had, and also about “por caballo” – going by horseback. But things were beginning to fall into place. Local knowledge of the landscape from Iván and Isaías, we realized, was far superior to Google Earth in “Muir-tracking.” From the entrance station to Parque Nacional Tolhuaca where we talked to Isaías, we could look up and see what Muir described as “… a ridge 1,000 feet hi bordering the south side of a glacier meadow, the top of which was fringed with the long-sought-for Araucaria.” We resolved to return the next day, climb the ridge, and try to find Muir’s campsite. But the next day was pouring rain. We drove from our base, the guesthouse called “Suizandina” near Malalcahuello, to the Parque Nacional Tolhuaca, and talked again to Isaías. It was too wet to ascend Muir’s ridge, so as a consolation we stopped on the way back at the Termas de Tolhuaca. 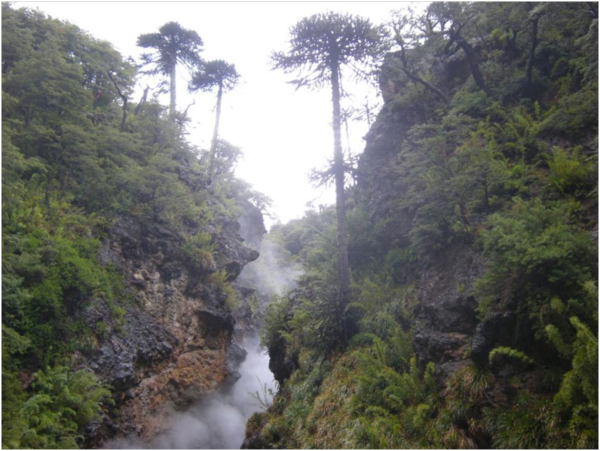 Clouds of steam rose from a cave in a narrow gorge, from which the scalding volcano-water poured into the hotsprings pool, and swirled up between the cliffs above a raging stream on which Araucarias perched precariously. We spent the dreary afternoon soaking with a small happy group of pink, parboiled Chileans in the pouring rain. The next morning it was foggy – as it had been for Muir on the day he began his successful trip to the Araucarias. We set out again for the drive to Parque Nacional Tolhuaca. The fog lifted unexpectedly and the sun broke through the clouds. We parked in view of Muir’s ridge, and set out, prepared for a long day. In his journal entry for 20 November, 1911, Muir wrote: “Long scramble up the steep grassy slope and brush. One horse fell and rolled….” As we bushwhacked our way up the very steep slope through a nightmarish tangle of quila, the native bamboo, Chusquea quila, and brushy ñirre, Nothofagus antarcticus, we were convinced that in Muir’s day the vegetation must have been less dense. This was steep, but we couldn’t picture horses going up this. It was hand-to-hand combat with the dense understory vegetation. Finally, sweaty, we reached the top of the ridge, and stood under the first Araucarias. 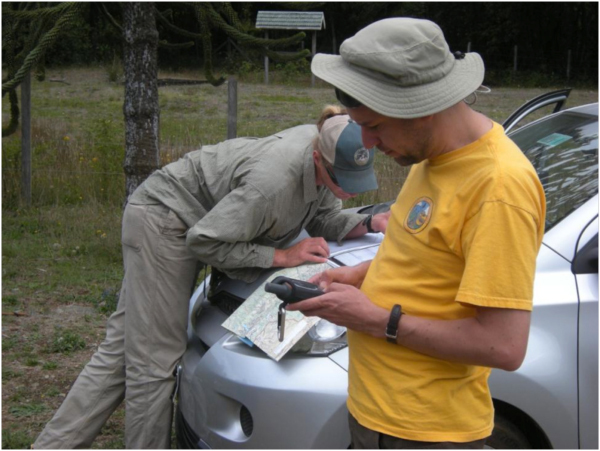 Our GPS recorded a climb of 330 meters – Muir’s estimate of the height of the ridge was 1,000 feet. For those not familiar with the metric system, you can’t come much closer than that. On the drier, rocky, north-facing lip of the ridge, the going was a bit easier. 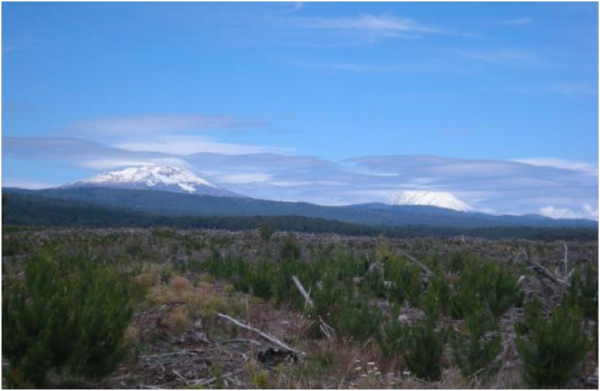 Muir wrote that they “… traced the ridge a mile or two, admiring….” So did we, following the ridge westward and admiring the views down into the valley of Laguna Malleco, of the rugged country on the flanks of Volcán Tolhuaca, and with grand umbrella Araucarias all around. As we approached the bottom of the shallow valley, we heard a singing stream. 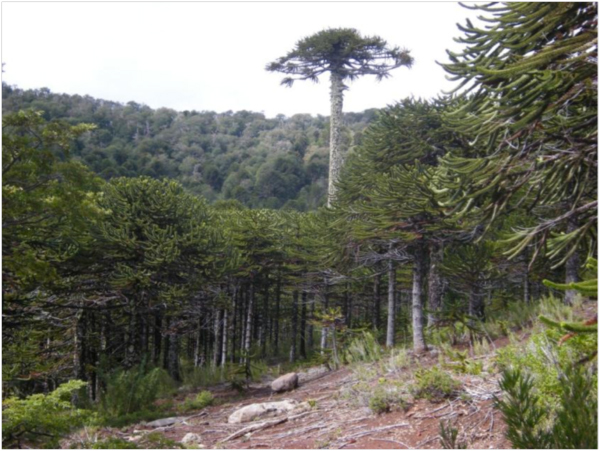 Here the forest was an exuberant mixed-age stand of nearly pure Araucaria. 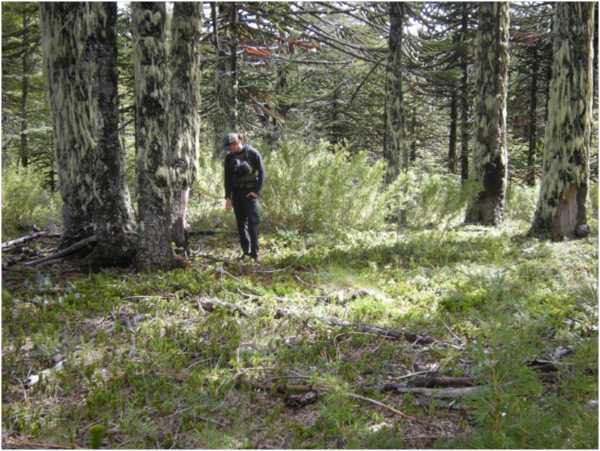 We broke into a more open area, with a circle of old Araucarias. I have always had a strong sense of what feels “right” when it comes to camping places, a sort of campsite “feng shui,” which has from time to time actually led to serious arguments with good friends about where we would camp on backpacking trips. When we reached that place, I immediately had the sense of “if I were camping, this is where I would camp.” Jonathan was exploring the circle of old trees, and when we met again he independently said “I have a feeling that this is the place.” Looking more carefully, we discovered scars with old axe marks on the bases of several of the big Araucarias in the grove, with bark regrowing around them, as if lower, protruding branches had been cut off. It was an eerie feeling, but we both felt then that we had found the exact spot where the Muir party camped. Muir slept under the stars that night, gently chiding in his journal that “my three companions slept under tarpaulin tents strangely fearing the blessed mtn air & dew.” He spent the morning of 21 November “sketching and photographing six views of the ancient forest.” None of his photographs seem to have survived the trip, but the sketches in his journal seemed to confirm that we were in the right place. Sketch in Muir’s journal made on the morning of 21 November, 1911, near his campsite. The landscape has changed dramatically from the one he sketched. Imagining what we might find before our trip, we seriously considered the possibility that we would find the natural forest of Muir’s day gone, replaced by plantations of Eucalyptus or pine. Happily, the native forest is thriving, probably much less affected by human activities that a century ago. 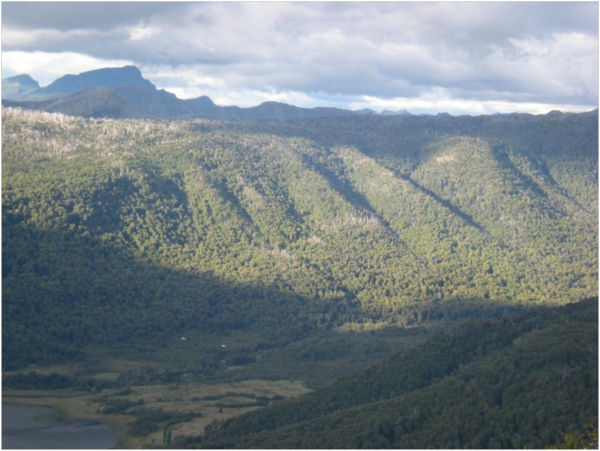 A nearly pure, mixed-age stand of Araucaria now fills the valley where Muir and his companions camped. 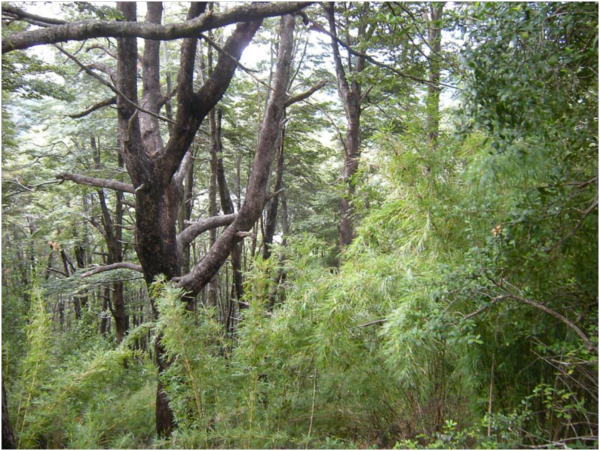 Because of the tall understory of young Araucaria it is impossible to get the exact views that Muir sketched. It seems likely that he was not somehow “seeing through” the understory vegetation with an X-ray imagination when he made his sketches – but rather that he was accurately sketching what he saw, and that the dense understory of today did not exist. That would indicate, most likely, a much higher frequency of fire in the decades before Muir’s visit than in the century since. A century ago, fires were probably started deliberately by the indigenous Mapuche or by colonists. 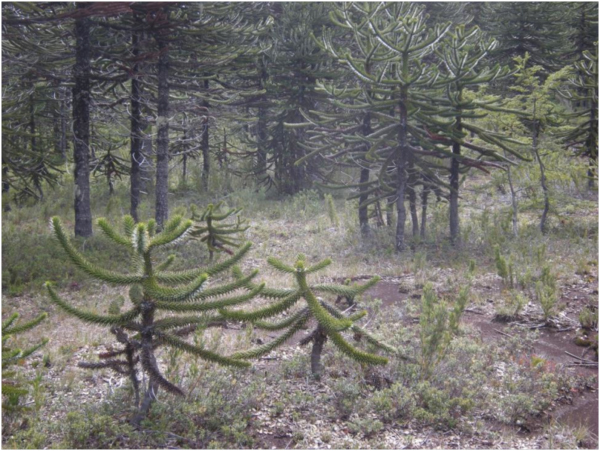 Fire is known to be a main determinant of the dynamics of Araucaria forests. 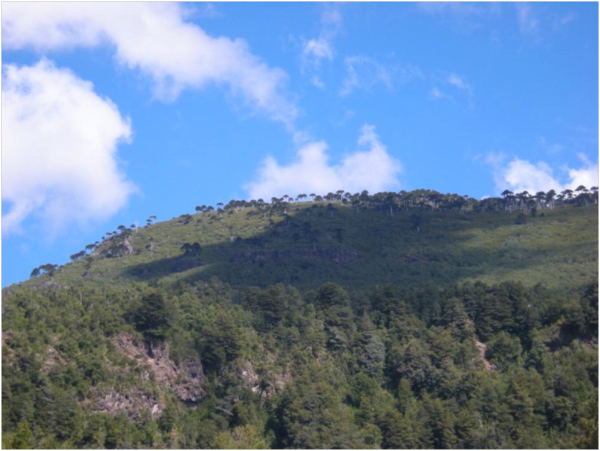 A careful study of the ages and fire history of the current forest in Ruca Choroy could probably reconstruct the forest history here, and we hope to conduct such a study of the area next year. We left the valley as late as practicable – we still had a three-hour hike back up the “cane-covered slope,” along the scenic ridge, and down the nightmarish slope of quila and ñirre, before reaching our car, and it would be dark by 8:30 PM. Weeks after finding the Araucaria forest, waiting in Buenos Aires for a ship to Africa, his correspondence to friends says things like “All I came to seek, I’ve found and far, far more.” But what was it that Muir was seeking, and what had he found? How would he have written about this experience, if he had written an article or a book describing it? His journal gives only notes – not fleshed-out, poetic, aesthetic descriptions; nor descriptions of the emotions that nature caused to resonate in him; nor philosophical pronouncements about the relationship between humans and nature – all of which are so typical in Muir’s published writing. We can never know. We can only imagine what he would have written about the Monkey Puzzles. In following Muir’s footsteps, I also came to feel that we accomplished “far, far more” than I had imagined. This final adventure of Muir’s adventure-filled life has been something of a secret for a hundred years, because he never published anything about it himself. Only in 2001 were his edited journals and correspondence from the trip published, making a wider circle of Muir scholars and fans aware of the journey. But no one had tried to follow his footsteps. We did, and in doing so brought Muir’s last journey to the light of day. 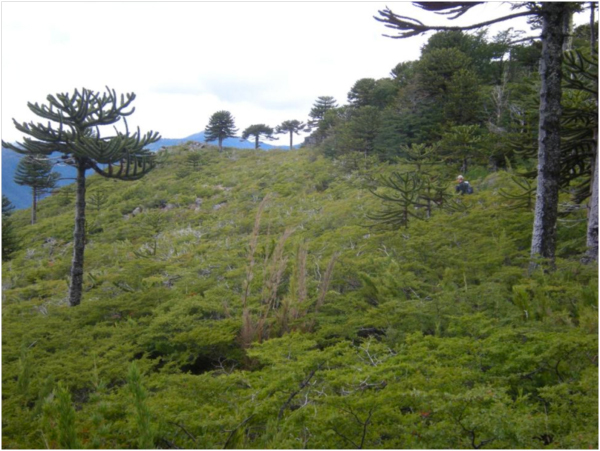 We walked the same rocky volcanic ridge that he followed, with its weird and wonderful old umbrella Araucarias. We listened to voice of the “brawling bouldery stream” in Ruca Choroy beside which he must have camped. We can now share images of those views, those trees, that stream, that ridge he sketched. Although we found that no Chileans knew about Muir’s journey, we met several local park rangers who recognized right away, from Muir’s sketches, where he must have been, and could point us more or less to the location on a map. And we unexpectedly found four of Mr. Smith’s grandchildren still living in Victoria, all apparently oblivious to this amazing bit of history their family had participated in – hosting John Muir on one of the last explorations of his life. All we came to seek we found, and far, far more. Great story. I’ve seen some big ones in Portland, perhaps some seems fell out of John’s bag when he passed through in 1899. Johnny Aruacaria-seed! Now that’s a good story. Are you sure John passed through Portland in 1899? The real reason Portland is full (relatively speaking) of Araucaria araucana is that at the 1905 Lewis and Clark Centennial Pacific Exibition there, Chile had an exhibit at which they gave away little Araucaria seedlings, hundreds, maybe even thousands of them. Portlanders took them home and planted them. At least that’s the explanation I’ve heard. Probably a good story in researching all that too! This is an excellent article. I’ve read the book about Muir’s trip and always assumed he had been closer to Llaima. Once, at the Buenos Aires Herald, I found an interview with Muir after his visit the Jardín Botánico in Palermo in 1911, but I can’t find it in my files right now.